Geemer's official artwork for Super Metroid. Geemers (ギーマー, Geemer) are enemies in the Metroid franchise. Geemers are basic enemies from many Metroid games. They originally debuted in the first game in the series with the name "Zoomer", although it was more accurately re-translated as "Geemer" in Super Metroid; Metroid Prime would later establish Geemers and Zoomers as related species. They are not immediately hostile to Samus, and simply move along the borders of terrain. Geemers are generally weak and easily dispatched by a few shots. The Smash Run appearance of the Geemer is based on its design in Other M, which in turn is modeled after its sprite from Super Metroid. A Geemer with a Mii Brawler in Smash Run. Geemers appear as enemies in Smash Run in Super Smash Bros. for Nintendo 3DS. They move along the shape of the terrain, often appearing on soft platforms. They do not actively attack the player, but they deal minor damage on contact, and cause meteor smashes if the player is below them. It is best to dispatch them with projectiles or other long-range attacks, as attacking them directly will also hurt the player. Shadow Geemers in Master Fortress. In Super Smash Bros. for Wii U, shadow versions of the Geemers appear inside Master Fortress. The Geemer trophy is exclusive to Super Smash Bros. for Nintendo 3DS. 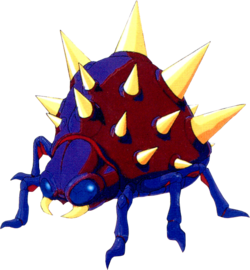 If you spot one of these creatures from the Metroid series crawling along, do your best to avoid those spikes on its back. In Smash Run, they could be on the floor, or they could be on the ceiling. Either way, you'll get hurt if you touch them, so keep a safe distance and take them out with ranged attacks. The Geemer appears as a spirit in Super Smash Bros. Ultimate, using the Zoomer's artwork from Metroid: Zero Mission. This Primary Spirit is Novice class and Shield type, with one support slot. Additionally, it reduces jump power. This page was last edited on February 18, 2019, at 04:02.